On March 11, 2015, the Omicron Phi chapter of Beta Beta Beta, inducted twenty regular members and five associate members into the nationally recognized biological honor society. 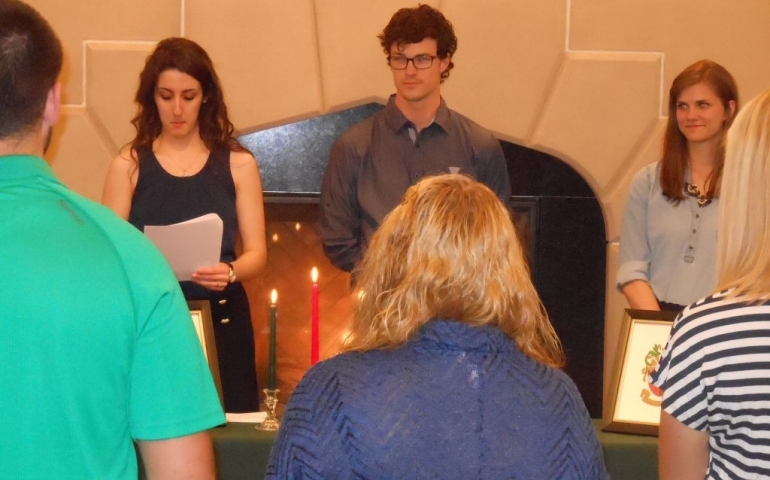 In a ceremony that was held in the Marchant Center, new inductees pledged to uphold the three main objectives of Tri-Beta. These objectives are to promote scholarship of the biological sciences, to promote the dissemination of biological knowledge and to encourage research. Regular membership inductees had met the requirements of maintaining a 3.5 GPA, and having successfully completed 3 biology classes. These regular members are granted the benefits of applying for Tri-Beta scholarships, presenting at Tri-Beta conferences and wearing honor cords at graduation. To become an associate member of Tri-Beta, one only has to have a passion for biological science. These members are allowed to attend national conferences, meetings and events. Maya Eskridge, a nursing major who was inducted as a regular member, was encouraged by her biology professors and husband to join. To her, the major of nursing was a good fit in a society that promotes the sciences and research. While Tri-Beta is growing every year, Calvert still thinks that there are a lot of people who are unaware of Tri-Beta, its benefits, and the fellowship that it provides for those that have a passion for science. Calvert hopes that by bringing in working scientists from the surrounding community for Tri-Beta events, members will not only gain knowledge but also networking opportunities. If you would like more information on SNU’s Tri-Beta Chapter, you can contact faculty advisors Dr. Joanne Peterson ( jpeterso@mail.snu.edu) and Dr. Caroline Bentley cbentley@mail.snu.edu) or you can visit the Omicron Phi Chapter Facebook page.